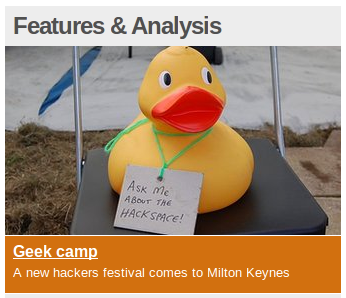 Ein the Duck made his first appearance in the national media when he appeared on the BBC News Technology homepage. Ein the Duck appeared as part of the Geek camp comes to Milton Keynes article, all about EMF Camp, the weekend-long hacker/maker camp running from 31 August to 2 September. If you’re at EMF Camp, come say hi to Ein!